REVIEW - PES 2016 - Use a Potion! I remember back in the era of the Playstation 2 there was a battle raging on – what was the best football sim? It was one sided for years, Konami’s PES series consistently coming out on top with critics. It was dominanting; EA’s lacklustre FIFA entries were constantly being out-performed by Konami’s vastly superior product. The first thing you’ll notice with PES 2016 is how great playing football actually feels. That may seem like a stupid thing to say, but it’s incredibly obvious; it’s satisfying to run with the ball, it’s satisfying to pass the ball, it’s satisfying to cross the ball and, most importantly, it’s satisfying to score goals. Everything feels natural and… well… fun. It’s the result of plenty of refinement and fine tuning across the board, but it’s all been worth it. It gets the simple things right and it makes the whole experience a joy to play. The PES series has always felt like a more arcade-like affair than the realistic approach that FIFA takes. That’s changed this year with a lot more factors affecting your play – the most significant being the improved collision system. Every encounter is a war against your opponent – you’ll be tussling away for control of the ball through each jump, shove and tackle. It works superbly, with each encounter having a very unique and authentic feel to it. Whilst big players like Zlatan Imbrahimovic will naturally be winning the aerial encounters, nippy players like Neymar will be able to outwit and speed through the tackle attempts. It lends itself to simple mechanics like protecting the ball too; it may not seem like a big deal but it’s implemented perfectly and feels satisfying to perform. Despite the superb physics system, it does come with one blaringly obvious flaw – the lack of fouls. I played through plenty of games and made a few sliding tackles that made me wince as I saw opposing players tumble in a heap, yet no foul would be given. It seems as long as some connection is made with the ball then the referee will consider it fair play, even if you do leave a player rolling in pain as a result. It’s actually quite comical, but laughs aside it takes away from how authentic the actual physics system is. Physics aren’t the only department in the game that have seen an improvement; the AI in the game has also made a lot of progress. Your opponents will keep at you, making your life all the more difficult on pitch. You won’t just dash past players or pull off sneaky through balls all the time; the AI is quite literally on the ball, adapting to how you play and making smart tackles to stop you. In a similar vein to the physics though, there are still a lot of flaws to be found in the AI. Sometimes your opponent’s goalkeeper would make the most awful decisions, almost passing the ball straight to your striker by playing the ball in his box. Whilst this isn’t unheard of on a football pitch, the manner of it in the game borders on stupidity. Sometimes your own players will seem completely out of position too. Even after fine tuning formations I found that sometimes my players would seem to be completely out of position. It wasn’t a consistency throughout matched, but when it did occur I couldn’t help but to feel frustrated. Whilst the flaws I’ve mentioned don’t break a football game, a poor shooting system will. Fortunately, PES 2016 sees you scoring some absolute screamers. Thanks to the improved physics and tighter controls, it feels like you can score from any position in the opponents side of the field; sure, it takes away from the realism of the experience but when you see a 30 yard shot blast past the goalkeeper does it matter? 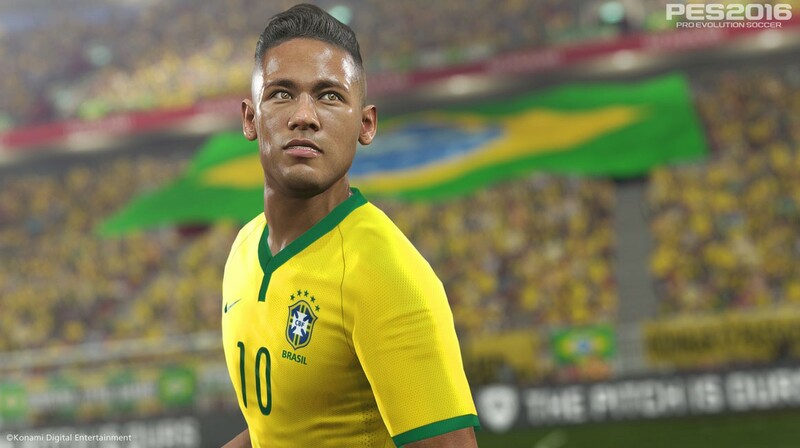 PES 2016 sees a huge improvement in the graphics, thanks in part to the use of Metal Gear Solid V’s Fox Engine. Some of the players look superb; they’ve actually gone all out on the licensed players with the faces looking ultra-realistic, almost identical to their real life counterparts. It’s impressive. Sure, those players who haven’t had the effort put in to be perfectly recreated look a little lifeless, but that’s to be expected in a game that features such a huge amount of players. Player animations are superb too – you don’t feel like each player is performing the same animation each time you shoot, tackle or save a shot but instead see different reactions each time. Almost a consistent theme within the game, for every thing PES 2016 does right with each dynamic of the game it also does something wrong. In regards to the graphics, it’s the awful menus of the game. The menus are at times a pain to navigate through and are just plain ugly. Sure, the important part of the game is the actual gameplay, but this is an area that could see improvements in future iterations – if only for the sake of accessibility. The one area where PES has always fallen short to FIFA is with the licences; whilst you’ll see plenty of perfectly re-created players with the correct names, don’t expect to see them playing under the correct team name or authentic kit. There are a few licensed teams in the game (Manchester United, woo! ), for the most part you’ll be playing for with PES’ alternatives. Sure, you’re able to re-name teams and even re-design kits, but those looking for a wealth of licensed teams and leagues may want to consider FIFA. Of course, PES 2016 does have the ‘Champions League’ licence and allows you to play through a full campaign. There’s also the ‘Player ID’ system; certain players have been not only re-created to look identical to their real life counterpart, but play exactly the same too. It’s incredibly authentic, and even carries over to goalkeepers. It’s all about the tiny details; something all fans of football should appreciate. PES 2016 also sees improvements to its main game mode – Master League. It feels more refined and easier to play with a much improved transfer system and better presentation. The mode is all the more accessible too, with the option to automate things such as team selection and even in-match substitutions. Of course, you are able to manually control all these aspects if you like; it’s all down to preference. It’s always been PES’ best mode, but this year’s improvements really bring the Master League to life. Further developments have also been made to last year’s new mode, myClub. You can now level up your players or even assign them as ‘trainers’ to help improve the other members of your team. Whilst it tries to play as an alternative to FIFA’s ‘Ultimate Team’ mode, there’s actually a few aspects I think it does a lot better – the main one being scouts. Rather than buying packs of players, myClub has you purchasing and using scouts – the better the scout, the better the players they present you with. It’s actually a more realistic approach and it’s nice to see Konami trying something a little bit more creative with the mode. In addition to the game modes is the online mode which, finally, works perfectly. 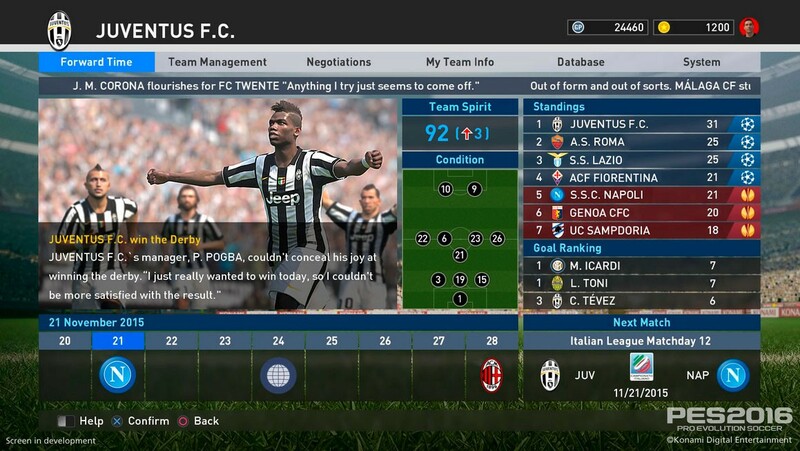 Whilst PES has a dark history with it’s online aspects, it has finally got it right here. It never took too long to find an opponent and when I did the matches played out with no lag. 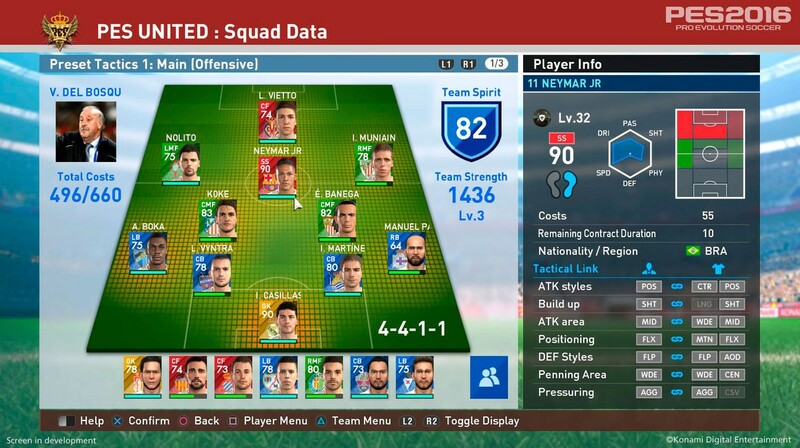 It took awhile but it seems that PES has finally got the online formula right. It feels like Konami have finally found that winning formula again with PES 2016. It’s seen plenty of improvements to every aspect of the game: the great physics, the AI, the graphics and even game modes. Hell, they’ve even nailed online mode this year. For everything that has been done right though, there’s always a few issues. Whilst most of these can be looked past, it’s hard to ignore the lack of fouls in the game. It doesn’t stop it being a fantastic game to play though and definitely a solid alternative to FIFA. 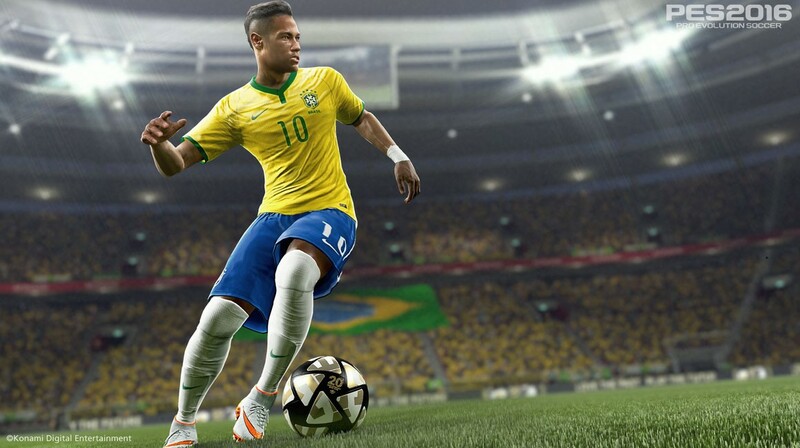 The biggest thing that will hold PES 2016 back though is its lack of licenses. Football fans love playing as their favourite team or being able to play in the authentic leagues. PES simply can’t compete with FIFA in that respect. It all comes down to you – if you can look past the lack of real teams, real kits and authentic leagues, then PES 2016 is a damn good alternative to FIFA. Whilst it doesn’t really better the game, it offers a football experience that certainly plays really well and often even tops FIFA with the fun factor. It is incredible how two different developers have made the beautiful game play so differently; we’re really spoilt for choice.